For all the complex financial products they can dream up, simple common sense still seems to elude the bright minds of Wall Street. 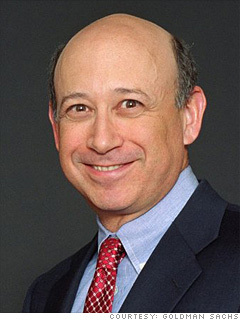 Or at least, Goldman Sachs CEO Lloyd Blankfein. Hoping to shore up his firm's battered image, he spearheaded an all-out public relations campaign this fall, touting his company's important role in building economies and helping everyday workers prosper. Last month, however, he got a bit carried away, telling a Times of London reporter that he was just a banker "doing God's work." For $43 million a year. But many knowledgeable people don't buy the story. Included in their numbers are President Obama, Mervyn King, Governor of the Bank of England, Adair Turner, chair of UK financial regulator, the Financial Services Agency - who described many of the investment banks' activities as "socially useless". But the public has received less information than they ought about quite fundamental questions. For example: What are banks for? Two letters from correspondents to the letters column of the UK "Guardian" newspaper might help to clarify matters. (The Guardian is difficult for bankers to seduce, as, unlike most UK national papers, its editorial independence is guaranteed by a Trust). "Lord Myners says "We all need banks to take risks" Sure, but what kinds of risk? What do we want of our banks? We want them to receive our incomes, pay our bills on request, and keep us informed of these transactions. If we lend them money, we want them to pay a fair rate of interest. We expect them in turn to lend that money to trustworthy businesses or individuals at higher interest. We don't expect them to indulge in casino-style gambling and then come cap in hand when the bubble bursts. What are banking services worth for watching over our money? Nurses watch over the sick, teachers watch over our young, social workers watch over the misfortunate, police watch over our safety. Comparable jobs deserve comparable remuneration. Obscene rewards for playing the markets, advising on mergers that (Mainly destroy value - author), cost workers their jobs, and recklessly endanger the environment, are just causes for our anger. Investment banking may (or may not) contribute to economic growth but little to the wellbeing of the nation." The second is from Ann Pettifor, a Fellow of the very interesting New Economics Foundation. "I was astonished to read Lord Myner's (New Labour minister) assertion that banks use our deposits to lend out to businesses and homebuyers..... We have just lived through a period of asset price inflation fuelled by credit-creation that bore little relation whatsoever to either a) our deposits in banks or b) to the underlying value of assets. The bank does not need savings, deposits or reserves to create credit. If this was the case, there would only be as much credit as there are deposits in a bank. These limits would have constrained an asset price bubble, as assets would not have been artificially inflated by under-regulated credit creation. Once a loan is agreed, the bank applies to the Bank of England for the cash element, which is a very small proportion in these days of credit/debit cards. The fact that small businesses cannot obtain loans from banks, except at high rates of interest, has nothing to do with our deposits, but with the failure of bankers to fulfil their role and meet the needs of society and the economy. Which is why Lord Turner was right to dismiss them as "socially useless". These letters get to the heart of the matter. The kind of banking that serves society - that is, millions of people on ordinary or moderate incomes and smaller businesses, ought to have different values, operate to different rules and be scrupulously regulated to prevent speculation and reckless gambling with peoples' money and funny financial instruments that few understand. Investment banking - the sort that amongst other things supports mergers and acquisitions and speculating with the wealth of high net worth individuals from tax havens, is a different order of animal and should be rigorously scrutinised to ensure that periodic systemic failures hurt only the rich and the bankers themselves - not the rest of us. Strong walls need to be constructed to separate the two.